Alpha Marine Installations LLC was founded in 2001 by owner James (Jim) Arnold. Alpha Marine Installations works from a trailerable 24 ft. landing craft that is sufficient to haul all necessary equipment used to install both Helix and Seaflex products. Our technology simplifies logistics and eliminates the need for large vessels, cranes and other equipment. Jim began scuba diving in 1997 and advanced to public safety diving with the Lewis County Search and Rescue Dive Team in 1998. Jim was also an assistant trainer for Rapid Deployment Rescue for Fire Departments. In 2001, Alpha Marine Installations owner Jim Arnold began working as a sub contractor for Doug Williams, the owner of Northwest Diving and Marine LLC and the Regional Director for the Washington State Fish and Wildlife Geoduck Program. 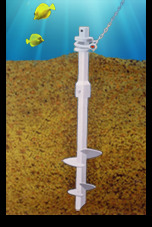 In 2003, Alpha Marine Installations purchased Northwest Diving and Marine LLC and franchise to the Helix embedment anchors for the Pacific Northwest. Since that time, Jim has made safety and design changes to the equipment developing efficient products that have improved the longevity and holding capacity to dock and mooring systems. In 2004, Seaflex was added to the Alpha Marine product line to work in conjunction with Helix Anchors creating an environmentally friendly floating dock/anchor system. 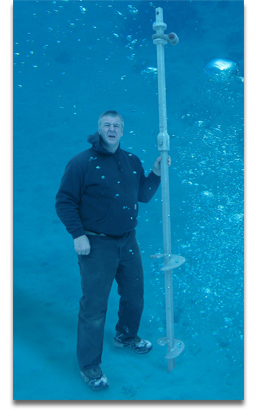 Jim is a trained Seaflex technician and consultant. Our company has designed and built hundreds of marine installations from Southeast Oregon to Alaska. Our work has been featured in September/October 2008 issue of Marine Dock Age and April 2009 issue of Northwest Yachting. In addition, Alpha Marine Installations has appeared on King 5 news story by Gary Chitum Hold Your Anchor, Use The Buoy on April 29, 2010. Alpha Marine Installations can be found at the Seattle Boat Show each year.